When New Super Mario Bros. was first released on the Nintendo DS in 2006, it was something special. It was the first Mario sidescroller in nearly a decade and a half. NSMB resurrected the core Mario gameplay in its purest form, introducing a whole new generation to the fun of Mario sidescrollers. It’s no wonder that New Super Mario Bros. would become one of the best selling video games of all time. Nine years and three sequels later, and New Super Mario Bros. has reemerged through the Wii U’s Virtual Console. Although it remains a fun game, time has proven that New Super Mario Bros. doesn’t quite measure up to Mario’s greater adventures. New Super Mario Bros. takes the Mario series back to basics. Sidescrolling stages are complimented by a world map, with a fortress and a castle waiting in the middle and end of each world, respectively. Toad Houses return, where Mario can gain additional lives or power-ups. True to the series’ lineage, the game has a grand total of eight worlds to traverse, though NSMB added an original touch by making two of those worlds optional. 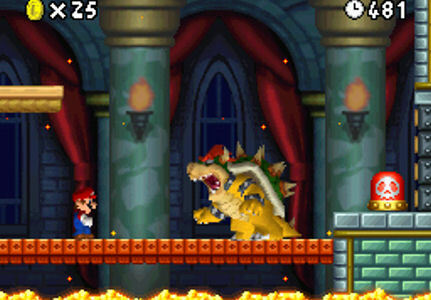 The core gameplay remains largely similar to the 2D Mario’s of old, though Mario has retained some of the moves he learned in Mario 64 such as the triple jump and wall jump. Power-ups include the returning Super Mushroom, Fire Flower and Starman, but New Super Mario Bros. also introduced three power-ups of its own. The Mega Mushroom works like a more extravagant Starman, with Mario becoming an invincible giant who crushes anything in his path for an allotted time. The Mini Mushroom adds a fun twist to Mario’s power-ups by downsizing the plumber. 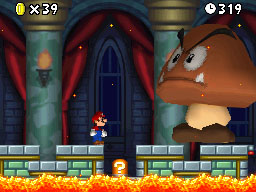 Whereas the other power-ups make Mario more durable, the Mini Mushroom makes Mario even more vulnerable to enemy attacks. But Mini Mario also jumps farther, can run on water, fits in small spaces, and is required to unlock the aforementioned optional worlds, so it has its perks. The Blue Koopa Shell is New Super Mario Bros’ best addition to Mario’s arsenal, and it’s shocking it still has yet to make a return appearance in the series. Mario can withdraw into the Blue Shell to become an unstoppable force, bouncing off walls and plowing through enemies with ease. The level design is fun and varied, with some later stages introducing fun gimmicks to keep things fresh. But it is with these levels that New Super Mario Bros. falls short of its predecessors. As fun as the game is, the stages lack the intricate challenge of Super Mario Bros. 3 or the boundless imagination of Super Mario World. The stages of New Super Mario Bros. boast the series’ trademark sense of polish, but lack the genius and creativity of Mario’s best. New Super Mario Bros. also ranks as one of Mario’s easiest 2D platformers. You can get through the game in a few short hours with very little effort, with only the final world and some of the optional stages providing any notable difficulty. The game’s real challenge comes from tracking down three Star Coins on every stage. 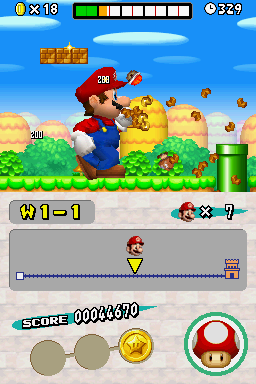 The Star Coins become progressively more difficult to find, and in some later instances require some clever maneuvering in order to nab them. The Star Coins are used to open up branching pathways on the world map and gain access to the Toad Houses, so they’re necessary if you’re seeking one-hundred percent completion. Finding every last Star Coin adds some replay value to the package, but it’s a shame the stages themselves don’t have the depth to hold their own. The game features some nice aesthetic touches, with the then-new 3D character models allowing for more dynamic animations than its 2D predecessors. The music, while one of the lesser Mario soundtracks, remains catchy nonetheless. For those who want to take a break from the platforming adventure, New Super Mario Bros. also features an assortment of mini-games that provide some quick bursts of fun. A multiplayer Vs. mode is present in the game’s original DS incarnation, but absent from the Virtual Console release. It was a simple multiplayer addition, so its absence isn’t a game-breaking loss, but it is a downer nevertheless. New Super Mario Bros. is still a very fun title for its tight gameplay and smooth progression, and it serves as a great introduction to Mario games for beginners. But for those who know what else Mario has to offer, there is a notable shallowness in its imagination. At the time of its original release we may not have noticed, we were just happy to see Mario return to his roots. But with a much meatier Wii U sequel available, and some of Mario’s best games at the ready on the Virtual Console, the nostalgia factor of New Super Mario Bros. can only benefit it so much. It remains an entertaining piece of game design, but it is humbled by Mario’s own past and future. My main problem with that game is how easy it is. The whole thing can be cleared very effortlessly; therefore, the goodness of the stage design goes by unnoticed. That low level of difficulty works for Kirby games, but for a Mario title it just doesn’t. However, the historic value of New Super Mario Bros. is huge…. it ushered in a new era of sidescrollers that gave us masterpieces like Tropical Freeze, Epic Yarn, Rayman Legends, New Super Mario Bros U, and others. It all started right there! I agree, Mario needs some kind of challenge to go with it. Kirby is supposed to be overpowered, so it’s okay when his games are easy. But Mario is supposed to be going through obstacle courses, not running on by. But yes, the upside is that NSMB opened the door for 2D platformers to make a comeback. For Tropical Freeze alone we should all be grateful. Exactly. Kirby is a powerhouse… he should kick everybody’s butts with ease. I think what broke the difficulty of New Super Mario Bros., as well as the Super Mario Advance remakes was that not only were extra lives much easier to get, but the number saved in between sessions as opposed to resetting to five every time. Nonetheless, I still think it’s a good game. That said, I think it has since been surpassed by New Super Mario Bros. Wii. I remember the bosses and levels having more variety than in the original DS game. Agreed. NSMB just handed 1-ups to the player, and it wasn’t a difficult enough game to justify that. The sequels were improvements (except NSMB2, which was an obvious cash in), with NSMBU being the best entry so far in my opinion.